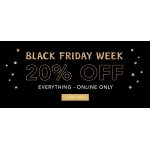 The Bows Boutiques Black Friday is on with 20% off everything. Free UK delivery on all orders over £75. The promotion is valid online until 28th of November 2016.